Yuefeng brand nickel chrome stainless steel shot. They are widely used in surface treatment of aluminum alloy, zinc alloy, stainless steel casting, etc. It can show the color and brightness of the material, but will not rust or change the color of casting surface. The casting has bright, smooth, even, stainless or dull effect surface. 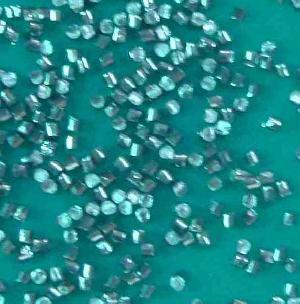 Yuefeng plays a leading role in stainless processing. We own abundant technology and good equipment. The rate of grain extraction is over 98%. We are the only manufacturer having this technique patent. It realizes professional production. It carries out SAE Quality Standard. Meanwhile, it classifies filtering according to ISO/TC24 Standard Screening to meet different requirements of prills. We survive by quality and develop by customer. We sincerely hope to cooperate with old and new customers to create bright future together!